The goal of these blog posts as well as our "How to" video library is to prepare PDP Clients to effectively use PDPworks 4.0. We're sure these resources will help you navigate your way through the app, whether that is logging in for the first time, creating a new team, or trying out the Side-by-Side report. But, we know that you'll not always have the time to access the "How to" library or this blog every time you have a quick question about something. 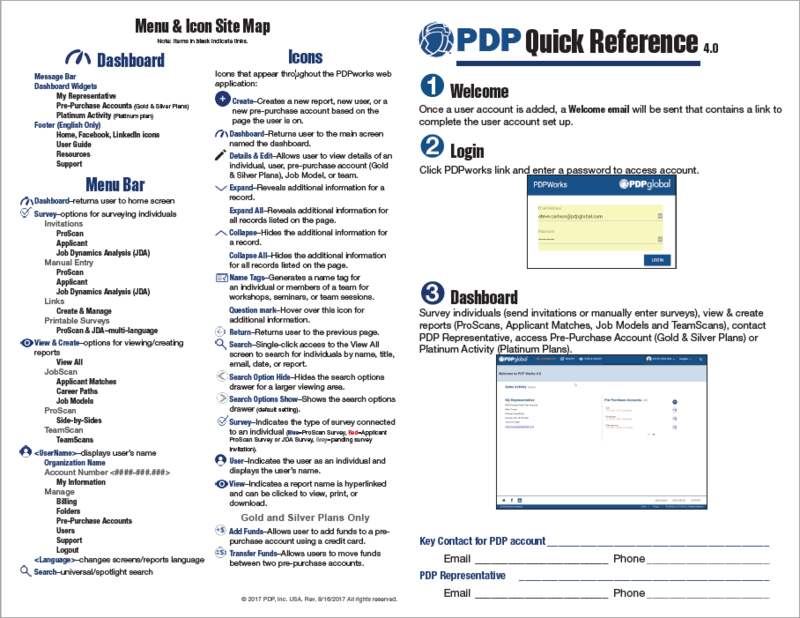 For this reason we created a mini "cheat sheet" called the Quick Reference Guide that you can print or keep on your computer's desktop. Like the full User's Guide the Quick Reference Guide walks you through each of the menu items, pages, and icons of the new app. Unlike its larger counterpart, the Quick Reference Guide does its job in just one double-sided page. For example, if you forget how to manage users in your account, create a Job Model, or send an Applicant Survey to multiple people, you can immediately get answers to your questions by scanning this two-page guide. Feel free to download this resource and save it to your desktop today. This is just one more way you can discover and take advantage of all the great new features and benefits of PDPworks 4.0. Watch your inbox for previews of new features, requirements, and report upgrades, as we move forward with upgrades to PDPworks 4.0. If you are not receiving our email announcements for the upcoming release, subscribe?